I’m sad that fiddlehead season is quickly coming to an end in Ontario, just as I found a new favourite preparation! 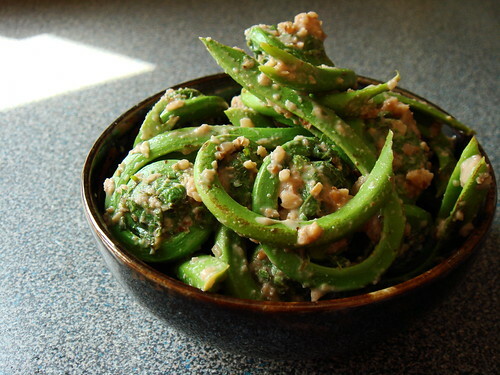 This discovery came first in the form of blanched green beans in walnut-miso sauce, a recipe by Yumiko Kano published in The New York Times a few years ago. I had a sudden craving for crisp green beans the other day. As all cravings go, I went overboard and bought way too much green beans for one meal. The walnut-miso sauce caught my attention because it was a protein-rich dressing packed with healthy fats. The Japanese touch of sweet white miso adds depth and savouriness. Miso is a staple at my house yet it never occur to me to build a dressing around it. What a fantastic idea. I started making the sauce as written but it was missing something. Miso is obviously salty and I wanted something tart to offset the highly concentrated flavour. Before I knew it, I added rice vinegar, mirin, and sake to the bowl. I stopped just short of adding in ponzu too. Hard to believe but I do think there is such a thing as flavour being too busy and confuse. Hurry! Must Rid Of All Perishables! Like most normal people, I clear my fridge of perishables before extended time away from my kitchen. For the last week, I’ve been exercising lots of self-control and refused to walk out of grocery stores with yet another small purchase from the produce or dairy aisle. It’s harder than I thought especially when the deal is good and the fruit is perfectly ripe. Well, that was how I ended up with two pounds of the most gorgeous sweet cherries I can possibly hope for in late May when I was suppose to be subtracting instead of adding. Besides, how else would I use up those buttermilk and eggs at home if I don’t have cherries to go with them (twisted logic, I know)! My original plan involved a buttermilk cake studded with cherries. Not long after, I got distracted by smitten kitchen’s brown butter cherry bar. But then, a quick search of my cookbook library and my eyes lit up at Cherry-Almond Cobbler from David Lebovitz’s Ready For Dessert. 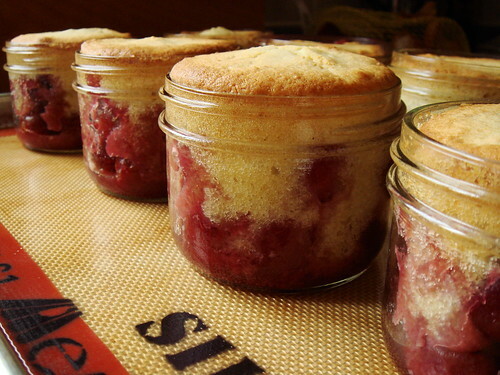 I always love the rustic quality of cobblers and one made with cherries just scream summer long weekend to me. The ingredients listed almond paste. Even better! I had a 200g tube in the pantry asking for some purpose in life. So what if the recipe wanted whole milk? Buttermilk would stand in just fine since the only leavener was baking powder. I bet the tangy taste would be a delicious substitution. I hang my head in shame today as I finally admit I am Chinese and fail at cooking rice. I cannot recount how many times I regretfully made Little Brother eat mushy overcooked rice despite serving up the most fantastic main courses. Let’s just say I’m glad they can’t revoke my claim to Chinese heritage! 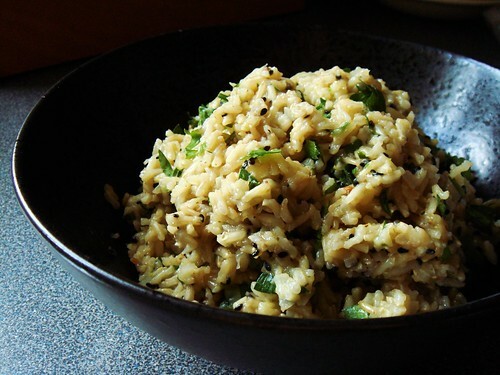 This week’s recipe from Around My French Table is Cardamom Rice Pilaf. I could keep you in suspense regarding the success of my cooking but I’m among friends here, I hope? Don’t let that photo fool you. My pilaf was fit for people with no teeth. Chewing is entirely optional. My cooking skill aside, this side dish has some great flavours mingling together. Brown basmati rice, onion, whole green cardamom, and lemon zest are simmered in vegetable broth. Just before serving, I folded in toasted black sesame seeds and chopped parsley. They make an otherwise beige dish look lively and add some freshness. The 2:1 ratio of water and rice is not right for the brown basmati rice that I used. The absorption method ought to finish off with all the cooking liquid absorbed into the perfectly cooked grains and/or evaporated. Despite my best effort to taste for doneness along the way, my rice was way overcooked and I had to drain away extra broth. What a mess. Rice used to be a staple at my home but it has fallen out of favour as I cease to cook Chinese meal on regular basis. Once upon a time, rice cooking was my assigned duty and I was able to churn out fluffy rice reliably. Somehow, I lost my touch. A friend helpfully suggested that I should get an electric rice cooker. I have not one, but two sitting in the cupboard! Since I only cook rice once in a blue moon, I figure I can save the hassle of digging it out and cook rice the old-fashioned way stovetop-style. With my awful track record, perhaps I should reconsider her suggestion. If you want to hear more successful experiences with Cardamom Rice Pilaf, I highly recommend you to check out the other French Fridays with Dorie bloggers! I have a special place in my heart and stomach for macaroon tarts. When I was a kid, afternoon teatime was a beloved family tradition. There was always a big pot of hot sweetened lemon tea to go with some kind of sweet pastries. More often than not, the treats would be a box of tarts purchased at the neighbour Hong Kong-style bakery filled with custard tarts (蛋撻) and macaroon tarts (椰撻). As much as I love custard, I always started with a macaroon tart first because I could never get enough coconuts. Plus I was distracted by the bright red maraschino cherry decoration. Years later, my choice remains the same. 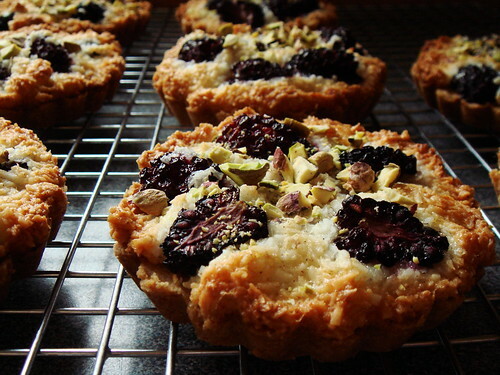 Heidi Swanson’s Super Natural Every Day contains a recipe for Blackberry & Coconut Macaroon Tart. A vegetarian cookbook promoting whole foods diet cannot be further away from the fusion Hong Kong cuisine of my childhood. Yet my taste memory involuntarily draws a connection between them. Must be that luscious coconut macaroon filling with crunchy crust and chewy centre. But this tart is so much more than just the filling. The crust is made with spelt and coconut flour which is so tender due to low gluten content. I added some ground cardamom to the macaroon filling to enhance the coconut taste. But the best part is the blackberries studding the top of the tart. These sweet tart berries taste almost jammy from baking and their fruity taste brings out such a pleasant contrast with the rich coconut. A bit of chopped pistachio top everything off in their lovely shade of green. There is a time and place for restrain but sometimes I just can’t resist leaving well enough alone. I bought a bag of dried hibiscus flowers (also known as sorrel or jamaica) for making Kim Boyce’s hibiscus rhubarb compote (which is fantastic. I’ll tell you more about it in a few days). I only used eight blossoms for that recipe so of course it became my mission to finish off the whole bag somehow. The first thing that came to mind was Hibiscus Agua Fresca from Heidi Swanson’s 101 Cookbooks. The tart and jewel-tone beverage served in a cold frosted tumbler is more welcome than cool breeze on a hot day. While the hibiscus blossoms were infusing, I couldn’t stop rummaging in the kitchen. A few thin slices of fresh ginger root, a fragrant vanilla pod, and a couple sprigs of mint soon found their way into the pitcher. I then recall reading somewhere that chia seeds are often added to agua fresca in Mexico and they would bloom into tiny flecks with a gelatinous coating. A handful of chia seeds quickly joined the party. Waiting was the hardest part. It took a few hours before the whole pitcher is chilled and I served each glass with a slice of lime. It was love at first sip. The cool mint balances perfectly with the tart hibiscus and sweet vanilla. The chia seeds reminded me of strawberries and kiwis in texture. There’s probably something super healthy about them too but I don’t really care. This drink is just fun and refreshing to kick off a summer of lounging around. 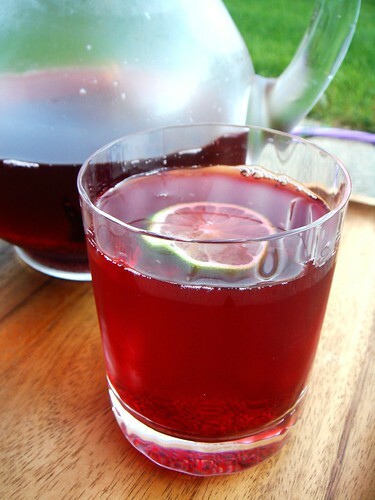 I think I’ll have to make this Hibiscus Agua Fresca with Vanilla Mint my official house drink of Summer 2011. * Those of you not familiar with the Kool-Aid Man, I highly recommend you read the Wikipedia entry. “He is typically featured interrupting children mid-conversation by smashing through walls and furnishings, brandishing a filled pitcher, and yelling ‘Oh Yeah!’”. No joke. Mascots are weird. I did not know there are so many ways to make granola bars until I tried out a bunch of recipes recently. You can bake it, or you can cook it over the stove. You can toast the oats, or you don’t. You can bind the goodies using anything from honey, maple syrup, agave, brown rice syrup, molasses, golden syrup, nut butter, to caramel. Think sticky! And I haven’t even touch on all the grains, nuts, seeds, dried fruit, and spices I can use to punch up the flavour! My latest batch of Chewy Ginger-Cardamom Granola Bar is a recipe from The Best Of America’s Test Kitchen 2011. This is a no-bake bar held together with a classic caramel sauce. Dry roasted almonds, pumpkin seeds, and sesame seeds are tossed together with buttery toasted rolled oats and multigrain Cheerios. Crystallized ginger, ground ginger, cardamom, and vanilla add a bit of zing in the flavour department. But my absolutely favourite part is the smoky caramel sauce made with heavy cream that adds such richness to the taste of these bars. These bars are absolutely addictive. They are a bit chewy but there is good crunch from the cereal and nuts. The spices are nice departure from the more common cinnamon. Did I mention how much I love the caramel? I sliced the 9x13 slab into 12 bars for a more substantial snack. 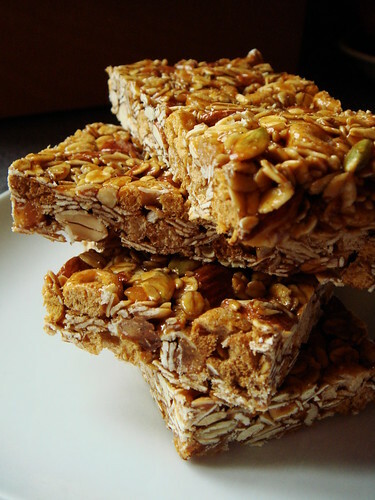 Like most granola bars, this recipe is prime for customization. For my next batch, I would love to increase the salt to make it a salted caramel granola bar. The cereal could be replaced with broken pretzel pieces and it never hurts to throw in a handful of dark chocolate chips for good measure. I love complex pain au levain as much as any bread lovers do but there are times when I crave a simple loaf of bread that is yeasty and sweet. Lucky for me, an enriched dough mixed directly using commercial yeast is the most achievable kind of bread I can make in my home oven. There is no need to look after a sourdough starter day in and day out. There is little concern for steam in the oven to create an incomparable crust. There isn’t even significant time commitment that ties me to the house while the dough ferments. This is the feel good bread that makes home baker feel like a superstar. I made the Buttermilk Oatmeal Bread from AntoniaJames’ recipe submission at food52. This bread has soft dense crumb that is perfect for slicing. 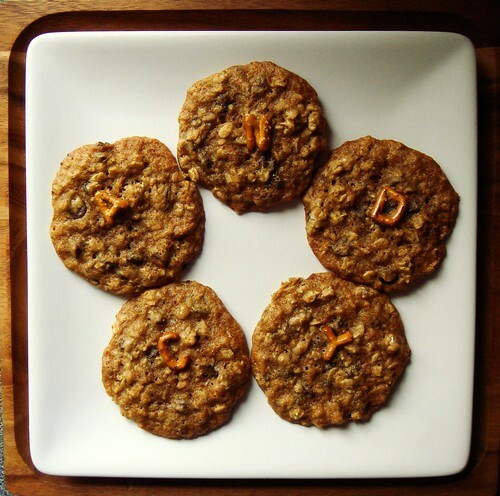 The taste is faintly sweet from the enrichment of buttermilk, rolled oats, oat bran, honey, and a knob of butter. But the smell! Oh my whole house smelled exactly like a bakery while the loaves were baking. It was the same irresistible aroma that draws me inside bakeries in early mornings. 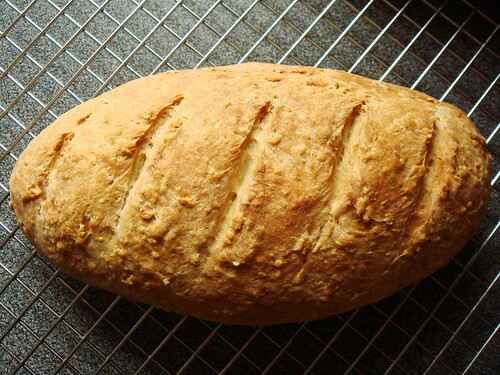 The outside of the loaves turned into an attractive golden colour with a little rustic bumps from the rolled oats. I had the most elegant breakfast a girl can possibly ask for on this weekday morning and I ate it over the kitchen sink. I made Serrano Ham, Egg and Asparagus Salad that is loosely adapted from Dorie Greenspan’s Around My French Table. 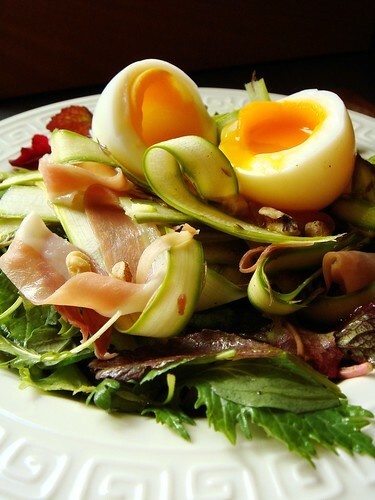 Ribbons of raw asparagus and Serrano ham are tangled on a bed of baby greens and topped with a soft boiled egg. A handful of toasted black walnuts echoes the simple vinaigrette of sherry vinegar, walnut oil, and olive oil. This salad is a celebration of spring with its gorgeous mix of assorted baby greens, crispy sweet asparagus, and the vibrant orange glow of egg yolk telling me the chicken at the farm have been grazing outdoor for some time now. The timing couldn’t have been better. Last night was the final share of my winter CSA before the summer shares begin again in a month. I returned home with my shopping bag full of vegetable and eggs (chicken and duck!) at their peak of freshness. Greenspan’s recipe asks for the asparagus to be blanched and served in spears. The soft boiled egg would be coated in bacon drippings from making crispy bacon crumbled over the salad. But when I have such fresh ingredients, I cannot bear to cook them anymore than necessary. I recently came across more than one blogger who raved about shaving asparagus into ribbons using a vegetable peeler and serve them raw with a simple vinaigrette. Well, now I understand all the praise. It’s hard to argue with the irresistibility of crispy bacon in most situations. However, I think the tender stripes of Serrano ham making a nest with asparagus ribbons is a much more appropriate choice. If you miss the smoky taste, using speck in a similar manner would be a good alternative too. I rarely bake sandwich cookies because they don’t seem like good value to me. Twice the work for half the yield doesn’t make good economic sense in my mind. Yet, sandwich cookies are key players in the cookie kingdom*. Can you even imagine a world without Oreo cookies? Milk would be so lonely. 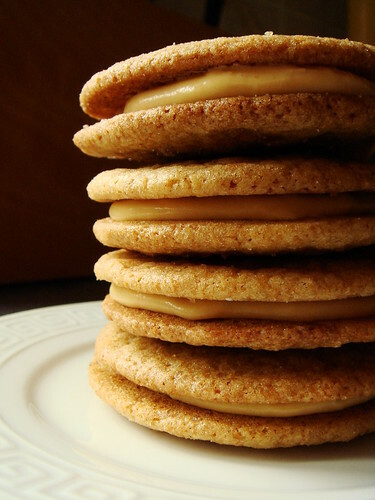 I didn’t set out to make sandwich cookies when I started my batch of Gingery Maple Thins. I was looking for something simple, preferably a bar cookie. I had my heart set on something made with oats but not a granola bar. Fortunately my search came up short and I came across the recipe for Gingery Maple Thins in last year’s issue of America’s Test Kitchen Holiday Cookies. What drew me in was the use of maple syrup in the dough and putting ginger centre stage with both ground ginger and crystallized ginger. Of course, the combination of these two flavours together is pretty novel to me too. I added a pinch of salt and 1/2 teaspoon of ground cardamom to the dough and really like the extra layer of fragrance. Instead of mincing crystallized ginger, I conveniently used ginger chips I have in the pantry. The recipe calls for maple extract and I was only too happy to use the excellent maple essence I bought at La Cuisine in Old Town Alexandria, Virginia. I remember what a hard time I had deciding which flavours to buy when I was in the store! Seriously, I wanted one of each. The dough was very soft and seemed sticky when I portioned them with a cookie scoop. It’s a good thing that I could drop the portioned dough directly into a bowl of sugar to coat the dough. Shaping it into a ball and subsequently flattening the dough was trivial. Before I sent them to the oven, I liberally sprinkled the dough with raw cane sugar crystals for good measure.